Takeaway: A reward or recognition program can be a great step to improving workplace safety, but only if it is done right and the rewards are appropriate. Having a reward and recognition program is essential to reinforcing positive health and safety behaviour in the workplace. Rewards and recognitions improve employee satisfaction and contribute to engagement by making employees feel that they, and the work they do, are very important to the company. That engagement makes a big difference for workplace safety. According to a 2016 Gallup report, companies with the highest rate of employee engagement experienced 70% fewer safety incidents than those with the lowest rates of engagement (learn more about The Importance of Employee Engagement and Its Impact on Your Bottom Line). The business costs and moral obligations associated with occupational injuries can be quite substantial: injured worker's lost productivity, salary costs, WCB premium increases, investigation and case management time, and so on. What's less obvious, however, is that successful safety programs with appropriate reward systems result in big reductions to indirect costs, due to increased productivity, increased morale, better relations between labour and management, and higher employee retention. But companies will only see great returns on these reward programs if they are well designed. So, with that in mind, here are some best practices for establishing effective workplace safety reward and recognition programs. Instead of the usual approach of looking for and correcting bad behaviour, it's best to identify and reward employees performing work according to good safety practices. Acknowledging work that is done right gives employees a target to shoot for and a clearer goal. The most effective rewards are those that come immediately and clearly when the work is being performed correctly. In order for your rewards and recognition program to be truly effective, it must be built into your safety programs from the very beginning. Incorporating rewards from the start optimizes safety buy-in and participation in safety initiatives (see 5 Reasons You Struggle with Buy-in and What to Do About It for a related discussion). 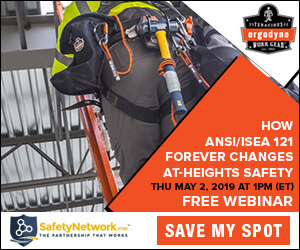 Companies that never had such a rewards system can, of course, retrofit one into their already established safety program, but this must be a seamless integration that is part of the company’s safety culture. It is unreasonable to expect that a single end-of-the-year banquet tacked on to the calendar can make up for failing to recognize and acknowledge positive behaviours in an ongoing fashion. While building the reward program into the system is a step in the right direction, it’s important to realize that they play a supporting role. Although an incentive program can enhance established occupational safety programs, it should not be considered a means for addressing underlying or chronic safety concerns. The reward program should also contain provisions to reward positive behaviours in all spheres of activity—not only for safety-related positive actions or behaviours. For example, quality-related positive actions should be considered and acknowledged. Employee participation in the design and establishment of the reward program is key to its success. Collaboratively deciding how to reward workers, how often, and for what benchmarks gives employees the opportunity to voice their ideas and concerns and increases their investment in the program. Involving upper management in the promotion and execution of the program sends the right message to all safety stakeholders. It is a concrete way to demonstrate that safety is truly part of the organization's culture. The best rewards are those that allow employees to "win" both individually and for their team. This helps to build a strong work culture—just as in competitive sports where one player can score points that count for the entire team, this cooperative approach strengthens work relationships. When an organization agrees on when and why rewards are attributed, the next step is deciding what the actual award should be. This can be tricky because giving a reward that is too small minimizes the importance of life-saving health and safety policies. An insufficient reward could be worse than not giving a reward at all (and be sure to reward the right behaviour. See Your Incentives Are Compromising Safety Culture to learn more). Reinforcing positive safety behaviours, using an appropriate reward, lets employees know that upper management and their supervisors recognize the importance of the choices they make on the job. And that goes a long way in encouraging them to make the right ones.